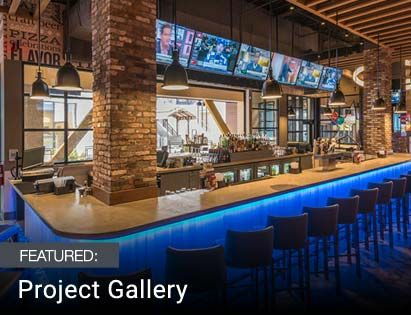 Rope lighting is an extremely versatile accent lighting product that is used by DIY’ers and electrical contractors alike across all manner of projects from residential to retail to commercial, and everything in between. We at Take Three have been proudly selling rope lights since the company first started. But there are a variety of different types of rope light available. Which do you choose? How do you know where to start? We’re here to guide you through the process and help you get the right rope light for your needs. Rope Light Technology: Incandescent or LED? Short answer: LED is the way to go. Okay, a bit more detail now. Incandescent rope lights used to be the king of accent lighting and are the reason rope lights became so popular. Their bright and flexible nature made for fun lighting installations. When LED rope lights first came out, they proved much more energy efficient, but their high initial cost made them tough to justify purchasing. Since LEDs have been out for many years now and dropped dramatically in price, there really is no reason to go back to an incandescent rope light. Incandescent rope lights consume a lot more power. They give off a lot more heat. They don’t last as long. And they’re more fragile. Whereas LED rope lights will save you money on your utility bill every month and last much longer. Rope Light Size: 1/2” or 3/8” Diameter? 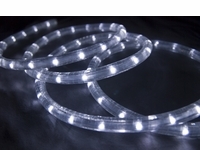 Rope lights come in different diameters, or thicknesses. The diameter not only determines the size and weight of the rope light, but also its flexibility. The most common rope light diameter is 1/2”. It is beefy enough to feel solid and durable in your hands, yet flexible enough to make basic shapes and bends. Another common rope light diameter is 3/8”, which is thinner and lighter. Due to its smaller physical size, it has increased flexibility vs. 1/2” rope light and is much better at making more complex shapes and curves. So the best diameter for you really comes down to the type of project you have. If you are looking to make a lighted sign with many curves, create a complex outline, or otherwise create any type of rope light run that has lots of tight bends and turns, you’ll find that the smaller 3/8” diameter rope light will be better at creating those curves and will be easier to work with. If your project is made of mainly straight runs or just has a few basic bends to it, the standard 1/2” diameter rope light will work just fine. 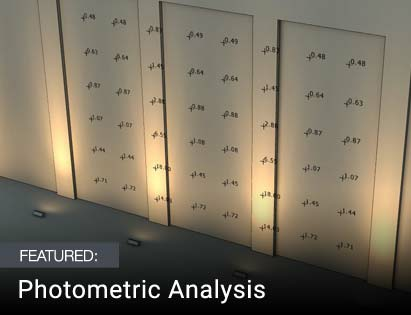 Most common applications such as building perimeter lighting, deck and railing lighting, cove lighting, undercabinet task lighting, toe kick lighting, under-counter accent lighting, and much more can be served with the standard 1/2” diameter rope light. Rope Light Bulb Orientation: Directional or Omnidirectional? We carry 1/2” LED rope lights in either directional or omnidirectional bulb orientations. Directional rope lights have the LEDs oriented vertically inside the rope light tube, shining their light brightly in one primary direction. Omnidirectional rope lights have LEDs oriented horizontally along the length of the tube, creating a more diffused 360 degree output of light. Each style has its positives and negatives. 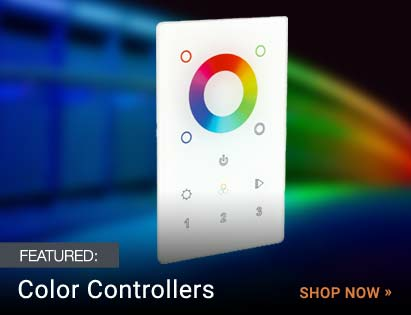 Click here to learn more about rope light bulb orientation. In general, if the rope light is going to be seen directly by the viewer and you want something bright to make a visual impact (think trade show lighting or architectural building outlines), go with directional rope light. If the rope light is going to be hidden behind a valance you just need a uniform glow of light without hotspots (think cove lighting), then go with omnidirectional rope light. Rope Light Length (Part 1): Bulk Spool or “Selectable Length”? 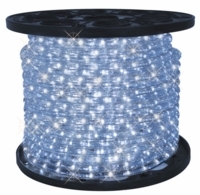 Buying 150 foot spools of rope light is a good choice if you have a lot of ground to cover with your rope light and you are comfortable with doing the cutting and splicing yourself. Buying in bulk is much less expensive “per foot”, so you can save a lot of money on very large projects. And working with rope lights (such as cutting them to length, attaching power cords, attaching accessories, etc.) is a fairly straightforward process; instructions can be found here. Please note that if you are installing your rope lights outdoors, you'll need to follow outdoor installation guidelines for sealing all connection points. The other issue to consider is code enforcement. 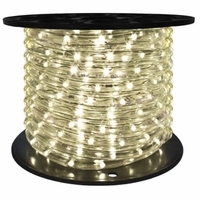 Bulk spools of rope lights are often UL or ETL listed as an entire spool…and only as an entire spool. Cutting a spool of rope light into smaller lengths voids any UL or ETL listing. If your local codes require that your project must have UL/ETL listed light fixtures, then you must either use the entire spool as one run, or go to “selectable length” rope light (see next section). Rope Light Length (Part 2) – “Selectable Length”: Kit or Custom Cut? When a bulk spool of rope light isn’t right for your project, either due to the UL/ETL listing issue or simply because you don’t want to deal with the cutting and splicing of the rope lights, the alternative is getting the rope lights in smaller pre-sized runs. This can be accomplished through kits or custom cut lengths. Rope light kits are premanufactured retail packages that include a complete UL-listed rope light system including the rope light itself, a power cord, end cap, and mounting clips. They are available in 5 preset lengths and cannot be cut. Rope light kits use special gasketed and threaded screw connections to attach the power cord and end cap (unlike the pin connections of bulk spools). You can also attach additional kits end-to-end to create longer runs as well as a special jumper designed for kits to customize your installation even more. This special gasketed screw connection is a key differentiator for rope light kits. Besides providing an extremely secure and weatherproof connection, it allows the rope lights to still be semi-customizable (i.e. attach multiple kits together) and makes them very easy to work with. Plus, it allows the rope lights to maintain their UL listings, a critically important issue for commercial installations. Custom cut rope lights are rope lights that are custom cut by the manufacturer to your specifications and assembled with a power cord and end cap using a UL-approved process, and as such are UL listed lights. The biggest drawback of rope light kits is the limited length selection; sometimes making getting to an exact length tricky if it isn’t one of the premanufactured lengths. Custom cut rope lights don’t have this limitation, and allow you to order your length of rope light custom cut to your project needs. The only limit is that all lengths must be in multiples of the rope light cutting increment, usually every 3 feet. Custom cut rope lights are designed as one complete rope light assembly, and are not intended to be cut in the field or be modified by having any additional power cords, jumpers or other similar accessories attached to them. So if you’re a homeowner and you want the best value for your money and you’re okay working with the rope light yourself, bulk spools are the way to go. If you don’t need that much rope light, then go with either a retail kit or custom cut to get smaller lengths. If you’re a commercial contactor and need UL/ETL listed light fixtures on your project, go with bulk spools only if it works to have 150-foot long runs, otherwise look to retail kits or custom cut rope lights. At Take Three, we’ve been helping homeowners and contractors alike with their residential and commercial rope light installations for many, many years. If you have any questions or need additional guidance on your project, please contact us.